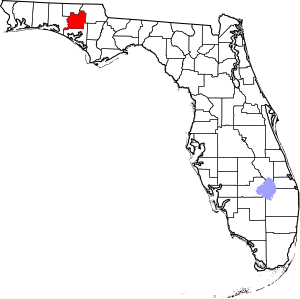 This is a list of the National Register of Historic Places listings in Washington County, Florida. This is intended to be a complete list of the properties and districts on the National Register of Historic Places in Washington County, Florida, United States. The locations of National Register properties and districts for which the latitude and longitude coordinates are included below, may be seen in a map. There are 4 properties and districts listed on the National Register in the county. National Register of Historic Places listings in Washington County, Florida Facts for Kids. Kiddle Encyclopedia.